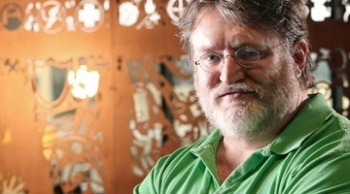 Gabe Newell believes that Valve is too independently-minded to survive being owned by another publisher. Valve is a bit of an oddity within the mainstream games industry. Where most developers require publisher support to make Valve-quality games, likely losing their IP rights in the process, Valve's private ownership and resources allowed it to sidestep the usual publishing chain entirely through Steam, its own content delivery system. That's not to say the prospect hasn't come up; rumors of prospective buyers have always circled the company, including, according to a source for the New York Times, publishing giant Electronic Arts. Valve President Gabe Newell responded definitively to such rumors by stating that a publisher-owned Valve is not only incredibly unlikely, but that staff would rather quit than remain employed with a restructured organization. In an interview, Newell stated that Valve employees are so independently-minded that the company would probably "disintegrate" if the ownership changed. "It's way more likely we would head in that direction than say, 'Let's find some giant company that wants to cash us out and wait two or three years to have our employment agreements terminate," Newell said. The comment is relatively minor within the context of the interview, but it's a strong statement about the way Valve operates. The company has already been recognized for its bossless culture that operates outside of formal or rigid corporate structures. Newell's comments imply that Valve doesn't just consider its corporate freedoms to be a perk or a privilege, but an ideal that staff would risk unemployment to preserve. Newell may not be directly speaking for all of Valve's employees to be fair, but given the enthusiastic support other staff members have shared about the company, he may not be far from the mark.